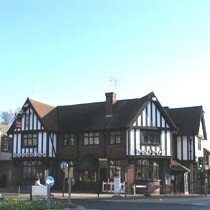 The Blacksmiths Arms in St Albans has gone through many changes over the past years. It was one of my favourites around ten years ago when it had a great selection of real ales straight from barrels lined up behind the bar. It even hosted its own beer festivals. Nowadays it has stopped serving real ale, although it has left two handpumps (Bombardier and Youngs) attached to the bar to frustrate us real ale drinkers. They do have a good selection of bottled beer at £2.95 a time. Prices of draft beer were reasonable but shorts were expensive at £3.25 for a gin and tonic. Although the pub from the outside looks very traditional and oldy worldy, on the inside it is very modern with wood laminate flooring, bright lights and plasma screens. It attracts a wide range of drinkers but in the later part of the evening the clientele would be mainly young with a high percentage of those being men. Service was quick and pleasant and one of the great features of this place is the large patio/garden area at the back with plenty of seating. The Blacksmiths is quite busy all day as it is a good stopping point for shoppers taking a break. Food is served all day until 9pm and consists of a reasonable selection of pub food at good prices. Although there was quite a lot of background noise, the pub often seems to lack atmosphere. As well as having two plasma screens and a projector the Blacksmiths also had a pool table. Karaoke takes place on a Thursday evening..
Appears to occasionally sell Deuchars IPA so real ale score updated to 2. Now advertising that they sell London Pride and Bombardier cask ales from £1.50 so real ale score updated to 5. Availability of these ales needs to be tested. Following a minor refurbishment and a change of landlord in May the Blacksmiths are now offering five real ales. Timothy Taylor Landlord and Charles Wells Bombardier seem to be regulars with the other three pumps offering guest ales. At a visit in July they had Brains Rev James, Landlord, Bombardier, Summer Lightning and a local brew on their five handpumps. The projector has been replaced by two plasma screens and all sport on Sky is shown but it doesn't dominate the pub as the volume is low or off. Free Wi-Fi is offered and currently there's an incentive to get a free pint of real ale for every six pints of real ale purchased if you get a card stamped for each pint. The pub is now cleaner and smarter and now attracts drinkers of all ages, whereas previously the pub was dominated by younger drinkers. Much improved recently so the score has been updated to 7.5/10, previously 5/10. Eight handpumps are now installed. Timothy Taylor Landlord and Wells Bombardier are standard ales whilst the other six handpumps have guest ales that aren't commonly available. Bands play most Friday and Saturday evenings from 9pm. Now up to ten real ales available with the occasional dark ale. Some great bands at weekends, check LemonRock. Regular beer festival on the last weekend of each month adding up to eight extra real ales. Patio/Garden very popular in summer evenings. There's even a plasma tv in the garden showing the footie. "What a vast improvement!! Now has 5 cask ales on including Tim Taylors Landlord and 3-4 guest ales along with a buy six get seventh pint free loyalty offer. Great food and reasonably priced too. Lovely big garden. Live bands including jazz and blues." To enter a pub review or feedback on this website please follow this link: Guest Review.